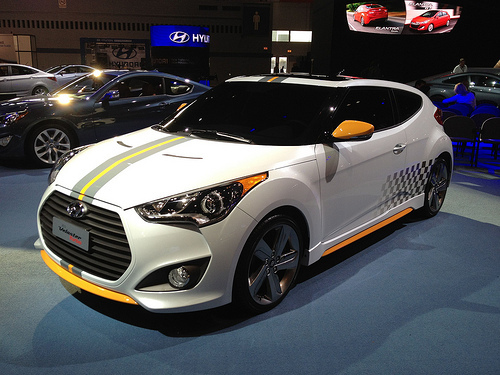 The Hyundai Veloster doesn't have much to complain about. The recent addition to our new cars under 20 000 section sports a $17,300 starting price tag for this unique three door hatch back. It has great styling, and even better fuel economy with a highway mileage on par with other 40 mpg cars. And of course it's quirky. But, and there is a but, that great mileage comes at a bit of a tradeoff. Namely power. For a car with a name that combines the words 'Velocity' and 'Roadster' one would expect that somewhere one of the Hyundai dealers in southeastern MA would have a performance option. Sadly while they offered some nice Hyundai incentives, they had no extra velocity to put in their Veloster. 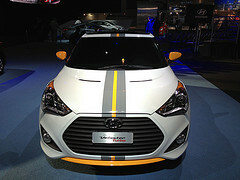 Hyundai Veloster Turbo - Hot Hatch? So there was some excitement when the Hyundai Veloster Turbo was announced that finally the unique four door setup (three doors and a hatch) might live up to its name. There was even more excitement when amongst all the other future cars for sale we got to see one at the 2012 Chicago Auto show. This sweet little turbo charged hot hatchback is going to take the current 40 mpg Veloster with 138 horsepower and jack it up to about 200 horsepower. 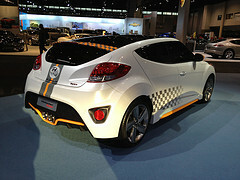 Of course in the process given all the extra body work and engine work on display at the Chicago Auto Show, we expect the price of the current new cars under 20 000 Veloster to get bumped right out of that category. Likely the Turbo will be priced somewhat competitively with a Volkswagen GTI which starts at $23,995. Hopefully somewhat less as the GTI is a pretty established among hot hatch cars for sale. And of course expect that 40 mpg cars label to go away with the Turbo as well, as this will be a much thirstier car then the 138 hp Veloster Hyundai incentives are currently selling. Still expect Hyundai dealers in southeastern MA to be happy, they'll finally be getting a car they can point to that will be worthy of the name.